Netherlandish painter, the younger son and pupil of Cornelis Engebrechtsz. His elder brother Pieter Cornelisz. Kunst was also a painter, they worked together in Bruges in the 1530s. 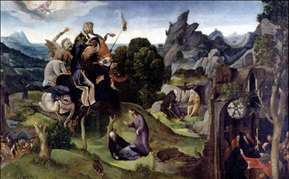 See more details about "Scenes from the Life of St. Anthony Abbot"